Mohammad Rafique , the legend of Bangladesh cricket, has ended his international career after serving Bangladesh cricket for 13 years. He is the most successful cricketer in Bangladesh history who holds the record of highest wickets in both forms of the game. Rafique is leaving international cricket on a high and prior to his retirement he opened his heart to BanglaCricket editor Khondaker Mirazur Rahman. He shared his thoughts about his retirement and future plan, fond memories and Bangladeshâ€™s struggle in Test cricket. Mohammad Rafique , one of the rare breeds of Bangladesh cricketers, has ended his international career after serving Bangladesh cricket for 13 years. He is the most successful cricketer of Bangladesh history who holds the record of highest ODI and Test wickets of Bangladesh despite missing 20 Tests due to disfavour of the selection panel. Rafique enjoyed success in international cricket with his accurate rhythmical slow left arm orthodox bowling and bagged 125 ODI wickets in 125 matches and 100 Test wickets from 33 matches. He picked up 2 wickets in the last Test to join the club of cricketers who have earned 100 wickets and scored 1000 runs in both forms of the game. Apart from bowling, Rafique enjoyed reasonable success in lower order batting and guided Bangladesh to their first ever ODI victory scoring 77 as an opener against Kenya in Hyderabad in 1997. He also scored a fine Test hundred against West Indies at Gros Islet in 2004 to help secure a draw against West Indies. Rafique started his cricket career as a left arm seamer in 1985 with Bangladesh Sporting, a second division team of Dhaka League. His success as a bowler attracted Biman Bangladesh Airlines, one of the premier cricket clubs of Bangladesh, and he started playing for Biman in 1988. Rafiqueâ€™s transformation from a left arm seamer to a slow left arm orthodox bowler was inspired by his Biman team mate Pakistani Wasim Haider. Rafiqueâ€™s success as a SLA has inspired hundreds of young Bangladeshi cricketers to learn the art of left arm spin bowling and now it is one of the major strengths of Bangladesh cricket. Rafique is leaving international cricket on a high and prior to his retirement he opened his heart to BanglaCricket editor Khondaker Mirazur Rahman to share his thoughts about his retirement and future plan, fond memories and Bangladeshâ€™s struggle in Test cricket. BanglaCricket: At first thank you very much for your contribution to Bangladesh Cricket. You must be happy retiring on a high. Mohammad Rafique (MR) : Playing for Bangladesh is the best thing happened in my life. I sincerely tried to do my best for the country and I am happy that I earned reasonable success as a cricketer. I am not happy to retire at this stage of Bangladesh cricket. I feel I have cricket left in me to help Bangladesh establish as a competitive Test team. I wanted to play for another year as we have good number Test matches in next 12 months and I am fit enough to lead the spin attack for Bangladesh in those matches. BanglaCricket: If you were ready to continue playing, what led you to announce retirement from International Cricket? MR : I announced my retirement as a mark of protest. Itâ€™s better to leave before getting humiliated at the hand of some people who prevented me from playing Test cricket for almost 3 years. Last year selectors omitted me from the ODI squad without any notice although I was enjoying success in 2007 and secured 4 wickets in my last ODI appearance. Some people thought I am not up to ODI standard and they decided to drop me, they didnâ€™t even make a courtesy call to convey the message. After ending my ODI career when they left me out of the New Zealand bound squad, I immediately decided to call it a day. When petty politics and personal choices dominate over cricketing reasons, itâ€™s better to say good bye. I am approaching 100 Test wicket mark, I could have earned 150 wickets or even more if I have played those matches when I was at the peak of my career. I feel that some people cheated with Bangladesh, not me. Everyone related to sports or sports body should put country ahead of personal interest, but unfortunately thatâ€™s not the case in Bangladesh. BanglaCricket: What is your future plan after retirement? MR : I am retiring from international cricket, but I will play club cricket for another 3-4 years. I want to use my experience for the cause of Bangladesh cricket. I mentioned it before that I want to become a curator. I feel we are failing to utilize the home advantage due to lack of suitable wickets. I want to use all my cricket education and experience to help making suitable wickets that will suit our style of bowling. Itâ€™s very important for us to use the home condition to our advantage to win Test matches regularly. I believe a cricketer who learned the art of the game from the field can be a much better curator than a person who learned it from a book. I also want to engage myself to teach young talents the art of spin bowling and run nationwide camp for the youngsters. However, everything depends on the cricket board. I will be very willing to contribute, but I am not sure whether I will get that opportunity. BanglaCricket: You are the pioneer of slow left arm bowling in Bangladesh and now Bangladesh has a good supply of young SLA bowlers. Any thoughts for them? sacrificed for variation and that was always my motto throughout my career. Among current SLAâ€™s, Razzak has a very bright prospect and Shakib can be a very good all-rounder for Bangladesh. I have found another bowler, Mosharraf Hossain Rubel, who was my teammate in the national league, very promising and I have found my reflections in him. He has got some exceptional variations which can be very lethal weapon in Test cricket. I rate him highly to become the future spin king of Bangladesh. BanglaCricket: You are leaving the international scene permanently. You must have lots of memories to look back upon from your career? MR : I have got a very emotional attachment with cricket. I was a very simple man coming from a poor family. Itâ€™s cricket which gave me everything. I am leaving with plenty of fond memories. If I am asked to pick the best five moments of my career, I will put the 1997 ICC trophy win in the first place followed by debut Test match against India, First ever ODI win against Kenya in 1997, Test century against West Indies at Gros Islet and World Cup win against India. Apart from these, as a bowler I will always remember Multan Test against Pakistan and Fatullah Test against Australia. We went agonisingly close to register our first Test victory against formidable opponents but were denied by two legends of Test cricket. I felt deceived in the Multan Test as couple of legitimate shouts were turned down by the umpires and any of those would have resulted in a Test win against Pakistan. BanglaCricket: You were part of Bangladeshâ€™s inaugural Test squad and now retiring in which will be Bangladeshâ€™s 53rd Test. Why Bangladesh has failed to establish itself as a Test nation and good performances are so few and far between? MR : I feel we havenâ€™t done enough to raise the standard of our game. We need to play Test cricket regularly without any break and at the same time we must build proper infrastructure and facilities for cricketers. One without the other will not work. We still do not have a proper infrastructure in place after 7 long years which is a shame. We had a break from Test cricket which worked against us. We have suffered a number of wrong decisions from umpires on crucial occasions which didnâ€™t help to build the confidence in the young Bangladesh team. One or two win would have done wonders to the mindset of the young Bangladesh team and the scenario could have been different. Another problem is in our policy. Our team management never enjoys full freedom to select playing XI. The coach and captain should have the major say in deciding the playing XI. We must stop the practice to tell the playing XI over telephone. This prevents coach and captain to implement their vision to take the team forward. We need people with passion to run the show and without a professional cricket board; it will take longer than usual to establish Bangladesh as a Test nation. BanglaCricket: Lot has been said over the years about the domestic infrastructure. Do you have any specific suggestions? MR : My suggestion is simple. Train coaches from overseas academies and build sufficient indoors in divisional headquarters. If we can do these two things, the rest will happen with time. We cannot play cricket for about 6 months due to monsoon and we badly need indoors for this period of the year. Cricketers should be within the game for 12 months to stay fit and bring intensity to their game. And we need good coaches to teach basics to the youngsters. A good number of players are playing top level cricket without learning the basics mainly because they didnâ€™t have the opportunity to see a trained coach. We have large population and we need a very good number of trained coaches at different levels to develop our overall standard of cricket. BanglaCricket: You are retiring, Khaled Mashud already expressed his willingness to retire and Habibul Bashar is also on the verge of his retirement from International cricket. You three served Bangladesh cricket for a long time. Do you feel that you are leaving a vacuum behind? MR : I donâ€™t think so. No one is indispensable and you have to call it a day at some point. Young players need to step in to fill the void and we have plenty of talents in the current squad who can take the responsibility from the seniors. Ashraful is a positive captain and from what I have seen, Siddons is also a very fine coach. I see a bright future for Bangladesh team. 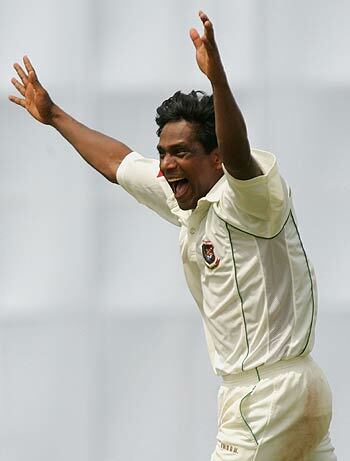 BanglaCricket: You are a legend of Bangladesh cricket. Bangladesh cricket will always remember you. Last word from you for the fans. MR : Fans have given me lots of respect and love. I do not know whether I was able to repay a part of it. I want to keep myself associated with cricket to help Bangladesh to break through the top 5 cricket nation of the world. Thatâ€™s my dream; hopefully I will be able to see that in near future. BanglaCricket: Thank you very much for your valuable time and thoughts about Bangladesh cricket. BanglaCricket salutes you for your service to Bangladesh cricket. This page has been viewed 13248 times.